Around 60 students form Toot Hill school in Bingham walked out of classes as part of the Day of Action. Students congregated on the steps of the Council House at around midday. Nottingham and more than 50 marched to the Trent building with banner. See COVERAGE OF MARCHES IN NOTTINGHAM, LINCOLN, LEICESTER ON ITV CENTRAL NEWS. At 4.00pm there was a ‘Teach In’ inside the Portland Building, where 40 students, staff and other NottsSOS members met to work towards future activities: Watch this space! 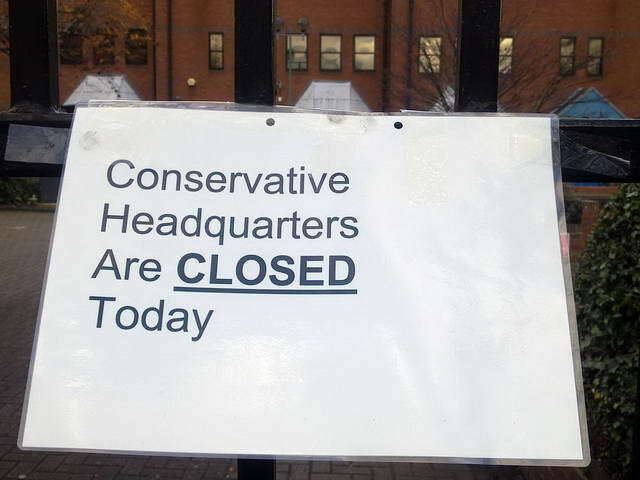 And all day the Tory Party HQ in Nottingham was closed because they thought it would be attacked again. It’s good that they have had to acknowledge the strength of feeling against them, and nice of them to save us the trouble of demonstrating there by closing down anyway! Let us know if we have missed any events you were involved in. We want to encourage more students – at school, college and uni – to take action and work together. Nottingham has never been especially radical in terms of student politics. 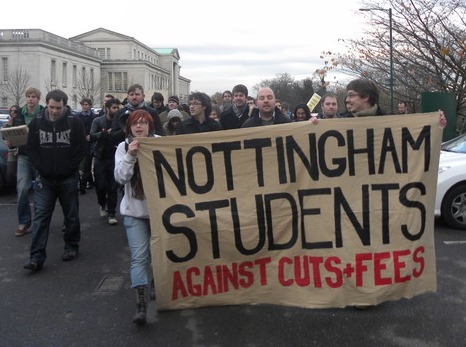 However, direct action has been taken at University of Nottingham several times on various issues. When the war in Iraq began hundreds of school children walked out of class to join a massive city centre demo. So we can do it! If we could get a massive reaction in Nottingham against the introduction of higher tuition fees and threats to Educational Maintenance Allowance for younger students, that would be proof that this current unrest is no flash in the pan but indicative of a desire for real social change. Young people will take what they are entitled to if the ConDems won’t listen, and their teachers and Notts SOS will support them. See also: UK COVERAGE on The Guardian website and on BBC. Plan for follow up STUDENT STRIKE on Tuesday 30th November (Facebook link). This entry was posted in Events & meetings, Road to success and tagged city, education, meeting. Bookmark the permalink. Encouraging meeting at the uni. Clearly some serious campaigning there looks likely and we should support them as much as possible, especially those of us in education unions like mine, the UCU, and the NUT. If anything gets going at the uni we should use it as a rally point for sixth form students who, elsewhere in the country showed their desire for a fight against the coalition’s plans. One thing that worries me is the possible division at a national level that might make things difficult at individual unis. The NUS did nothing positive for today as far as I see. What happened today was the work of a myriad of individuals and activists who just had to do something. We need unified campaigns against Fees and Cuts at uni level, as now seems possible at Nottm Uni, but also unity at a national level. The Notts SOS campaign with the involvement of various political tendencies on the left should discuss how we can bring pressure to bear to unite the student left against fees and cuts. WE NEED TO CONTINUE THE CAMPAIGN – KEEP UP THE PRESSURE – TAKE ACTION ON TUESDAY 30th NOVEMBER! 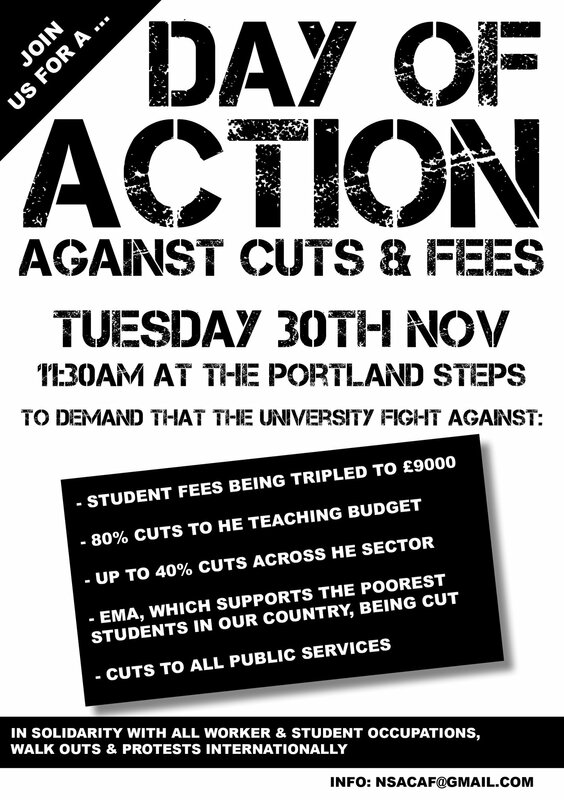 The National Campaign Against Fees and Cuts and a general assembly of London students have issued a call for further action on the 30th of November. We can’t let our campaign end with the walkouts on the 24th – we need to keep the action coming! On the 30th of November, take whatever action you can – either a walkout, a protest after college, a banner drop, an occupation, a protest during school… whatever it is, take action! In every college and every campus where action takes place, an ongoing organisation needs to be formed. A committee of mobilised students (whatever it calls itself) should meet every week (or more frequently) and democratically decide how to take the campaign forward. Where possible they should organise mass meetings in the college/uni to make decisions about the campaign. Set up a blog or a facebook group for your local and link it to anticuts.com. Try to pull off actions regularly, even if they are only small. Every city should have a city-wide general assembly every week that brings together representatives of all the different college anti-cuts campaigns. These city-wide assemblies should make decisions about joint actions. They should be run democratically – the chair should rotate and the meeting should not be the ‘property’ of any one group or faction. Everyone should respect the decisions that get made collectively. Send a report of whatever action you take to the National Campaign at againstfeesandcuts@gmail.com (also email us if you need help or more information). Include pictures if possible! AND REMEMBER – WHATEVER YOU DO, LINK UP WITH LOCAL TRADE UNIONS AND OTHER COLLEGES AND UNIVERSITIES! * Allow free access in and out of the occupation. Do something on a weekend folks! We parents want to stand next to you but work gets in the way. Is there a writeup of the meeting anywhere? Was the Claimant’s Union represented? Was the room booked rather than occupied? I’m curious about how far beyond University of Nottingham staff & students the discussion/attendance spread and would love any more information. I don’t really follow the logic of staging follow-up action on the isolated campus again, largely invisible to the wider groups at risk under the circumstances of cuts & service losses (practically everyone) when the fees issue can be brought under the NOTTS SOS non-sectatrian umbrella. A point: the flier doesn’t acknowledge that ‘The’ university is actually only one of two, and the one in possibly a slightly less precarious position (the flier reads as if it is only aimed at student of UoN, & so lacks a tone of unity). Was there co-ordination with local schools? From outside the organising groups, Nottingham looks at risk of punching way below its weight in the maintained campaign nationally. There’s a risk of worsening alienation using the UoN campus as a venue, it looks (& I think the worth of focus on ‘the Left’ is very debatable). Sorry to be critical, it probably reads more negative than intended – I think the fact it was carried off and that plans are being made is really great, and the 20th was excellent. P.s. Are there any local facebook or blog pages for the 30th? Ask through address nsacaf@gmail.com on the poster?